It’s 5am on a September morning in the Coliseum Industrial neighborhood of Oakland, and the streets are dark and empty. From the outside, the Civicorps warehouse looks equally deserted, but inside is a hub of quiet activity as young workers clock in and prepare to start their day. Two bleary-eyed but cheerful young men emerge from the building to check on a garbage truck warming up outside. Will Montolla and Fua Fatai drive Civicorp’s organic waste collection route. Civicorps, a non-profit, provides education and job training for high school dropouts. As part of the work program, participants collect recycling waste around the city, and as of last year it also collects organic waste from 164 restaurants and other commercial establishments. But the program is about to expand significantly, because Waste Management, Oakland’s longstanding waste collection company, has agreed to let Civicorps collect all of the city’s organic commercial waste. “This program will be a model for the entire country,” said Civicorps executive director Alan Lessik, because it represents a unique partnership between local business, city government, and job training for local youth. Including Civicorps was one of the less controversial aspects of the city’s hotly contested garbage contract, which was settled last week. Council members Rebecca Kaplan, Lynette McElhaney, and Dan Kalb, insisted that Waste Management partner with Civicorps, despite the misgivings of Waste Management officials, which the officials never explained. “This is an example of myself and two other council members standing strong for something that is incredibly important for the future of Oakland,” Kaplan said. Expanding organic waste collection will allow Civicorps to add 8-10 driving jobs and a new customer service internship program. Until then, Montolla and Fatai are the only drivers on the organics route. Montolla is 26 years old, and was recently promoted to a staff driver position after completing two years as an intern. As for what he was doing before Civicorps? “Nothing good” he says. “Nothing good at all. I was just out on the streets.” A former gang member, he earned his high school diploma and later his Class B driver’s license through Civicorps. Fatai, who’s 22, also earned his diploma with Civicorps. He doesn’t have his Class B license yet, so Montolla drives while Fatai sits in the passenger seat. The truck smells faintly of rotting food. “I would rather be here than anywhere else,” Fatai says. But as they pull into their first stop in Chinatown, he grimaces. “These garbage cans are gonna stink,” he says, making a face as he dumps a pile of chicken bones and what smells like rotten garlic into the back of the truck. Usually Fatai gets out to empty the can, then is back in the passenger seat in about two minutes or less. Montolla and Fatai pride themselves on their efficiency, stopping only once at a 7-11 for breakfast, which they eat in the truck. Montolla knows the organics route better than anyone at Civicorps, and he consults no map or list for the dozens of stops they make, even though the route is different every day. This expertise will be invaluable as Civicorp’s organics program expands. The council members who pushed for Civicorp’s inclusion in the waste contract did so not only because of the opportunities it provides for Oakland youth, but also because of the specific experience it has collecting organics. 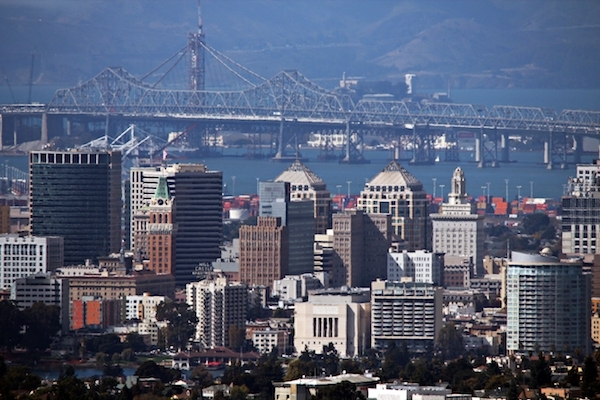 According to Civicorp’s Lessik, the Oakland partnership is the first time a job-training program has been included in a municipal government waste collection. Fatai and Montolla’s smooth operation is interrupted only a few times, when a heavy can slips out of Montolla’s hands at one stop, and again, just after sunrise, when Fatai calls out from the sidewalk, “You might want to see this.” About two-dozen live crayfish are crawling around on top of a pile of food scraps. Together they watch the little red bodies get scooped up into the hull of the truck. “RIP,” Montolla says, and they get back in the cab. From the overflowing state of most of the green cans, it’s easy to see why this is important. Three hours into their shift, the truck is full and they have to unload before continuing. Currently they dump the waste at the Berkeley Transfer Station to be composted. But within the year they will haul their foul cargo to the East Bay Municipal Utility District’s wastewater treatment plant in Oakland. Just as stomach bacteria break down food, the plant “digests” organic matter, converting it into methane, which is captured and used to power the facility. Civicorps presently collects about 6,500 tons of waste per year, but under the new agreement with the city, Lessik says, the total could be as high as 18,000 tons within three years. That’s enough fuel to generate up to 1 MW of electric power, which would meet the needs of about 1,000 households. Eight hours and over 100 stops later, Montolla and Fatai return to the warehouse. It’s 1:30 pm, but neither of them plans to rest. After work Montolla picks up his five-year-old son from school and they spend the afternoon together. Fatai is studying math at Merritt College, but today there’s no class, so he plays basketball with some friends. They will be back tomorrow at 5 am, and again on Saturday. Fua Fatai (L) and Will Montolla (R) drive Civicorp’s organic waste collection route.